Direct oral anticoagulants (DOACs) have become an attractive option for the treatment of venous thromboembolism (VTE) in cancer patients. However, their use is currently not recommended as first-line treatment by national guidelines due to limited data in this patient population. The objective of this study was to evaluate the practice and safety patterns of DOACs when used for VTE treatment in the oncology population. 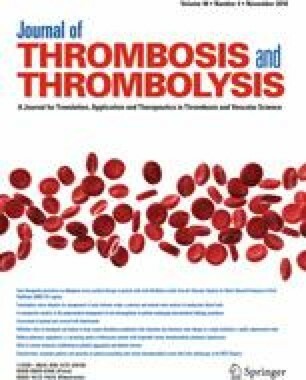 This study was a retrospective chart review of adult cancer patients treated at Hackensack University Medical Center from January 2013 to October 2015 who received dabigatran, rivaroxaban, or apixaban for VTE treatment. Of 126 patients screened, 39 patients were included. Thirty-five patients received rivaroxaban and four patients received apixaban. Ten of 39 patients (26%) were not receiving a DOAC dosage consistent with the package insert. No patients experienced clinically significant bleeding, while four patients experienced a minor bleed. Four of 14 thrombocytopenic patients (29%) did not have their DOAC dose held for thrombocytopenia. All patients had their DOACs appropriately held for procedures. Increased education on dosing DOACs according to the package insert is warranted for oncology prescribers. Despite the increased risk for bleeding in cancer patients, no clinically significant bleeding events were identified in our patient cohort. This data suggests that the use of DOACs may be safe to use for VTE treatment in cancer patients and may provide foundation for larger, randomized controlled trials to determine whether DOACs should be used for VTE treatment in cancer patients.